Your dog is more than able to keep himself clean. He’s rolling around, licking and chewing are all natural ways your dog cleans himself. However, when he’s been on a walk and is covered in mud, is getting a little stinky or his coats a little lacklustre, you will need to give him a helping hand. Certain breeds may well require you groom them regularly, and regular grooming is recommended regardless of your dog’s breed because it’s a great opportunity for you to bond with them and check them over for any physical issues that may not be visible. Basically – there are loads of great reasons to groom your dog and it’s really easy to do at home! How often you groom your dog will depend on his breed and lifestyle. Some may only need 5-10 minutes a day, some once a week, others may need hours a day of grooming. The tips in this article are for general grooming, depending on the breed and lifestyle of your dog you will need to adjust accordingly. 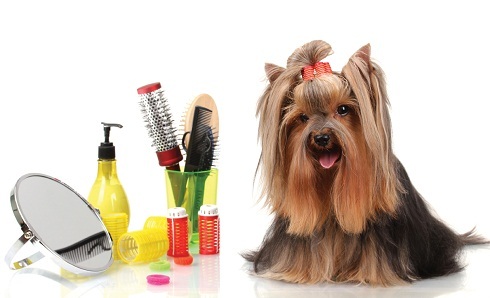 For the general pooch, grooming sessions won’t come naturally. If you have had them from a puppy, hopefully you’ll have been grooming them from early on so they are used to you handling them. If you have an adult dog you’ll need to be persuasive and patient with your grooming routine. Start with 10 minutes maximum of grooming a day, or even a few minutes if that’s all your dog will tolerate at first. Groom when your dog is as relaxed as possible and slowly lengthen the amount of time you groom your dog for and it will become routine for them. Try to gently groom all areas of the dog, including sensitive areas like their feet, ears, belly and tail. Offer plenty of praise throughout and make a big deal of any progress your dog makes with allowing you to groom them. Brushing your dog’s hair will help them in numerous ways. It helps remove dirt and debris, spreads the natural oils produced by the hair across the entire coat, helps remove and prevent knots and helps clean the skin. Brushing also enables you to check for signs of fleas. For smooth shorthairs you will only need to brush your dog around once a week with a rubber brush and bristle brush. If your dog has short fur with underlayers, you’ll need to use a slicker brush to remove knots, a bristle brush and a comb. Consider brushes that enable you to strip the undercoat which is often neglected when the top coat is the focus. For long haired dogs it is recommended you seek professional grooming guidance or advice on the particular breed you own. The amount of times you wash your dog will depend on their lifestyle and breed. As a general rule, look to give your dog a bath every few months using a dog-safe shampoo designed specifically for dogs. As a general routine you should start off by brushing your dog as normal. Following this, place a grip mat in the bath and fill it with a few inches of water or so making sure the water is lukewarm and never hot. Place the dog in the bath and use the shower head or a plastic jug to cover them in water depending on their tolerance. Avoid spraying water into their ears, eyes or nose. After you have thoroughly covered them in water, work the shampoo into their fur working from their head to their tail avoiding their eyes, inside ears and nose and paying attention to their bottom, genital area and legs. Rinse the shampoo off using the showerhead or plastic jug again avoiding the eyes, ears and nose. Take this chance to check the dog’s ears for any signs of infection. After bathtime take your dog out of the bath and place them on a large towel. If you can dry them with only a towel do so as this will avoid the chance of them overheating. If you understand blow drying a dog safely, blow dry them carefully checking the heat levels. It is recommended you don’t attempt to clip your dog’s nails if you don’t know how. Ask a friend who knows how, vet or groomer to do it for you the first time and show you how to do it, never attempt to cut your dog’s nails when you don’t know how to do it safely. Remember, bathtime can be a really good bonding time for you and your dog and is an important part of their general care. Opt for recommended grooming products from www.digbysdogplanet.co.uk and always seek advice about grooming if you are ever unsure. There are plenty of people more than happy to share their experience with you, enabling you to safely groom your dog for the many happy years you will share together.